Ghee Rice Recipe – Flavourful special occasion Rice dish made with nuts, fried onions and ghee! This is a famous Malabar rice recipe, also called as Neychoru , which can be made in Instant Pot or normal stove top. Let the name not mislead you.It’s not just Ghee and Rice, but it’s GHEE RICE!It’s the most epic form of rice ever! 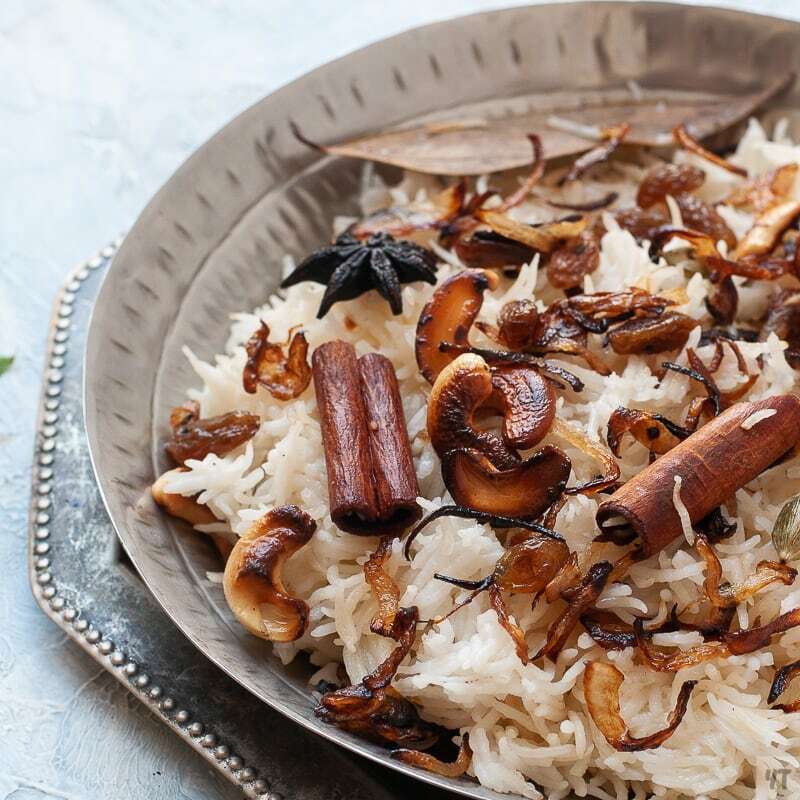 This is a famous rice recipe from Kerala though the preparation isn’t very distinctively Malabar.It’s usually served along with curries like Kerala Chicken Curry and Prawn Curryon special occasions and festivals. Ghee rice is naturally gluten free.This is not an everyday recipe but something to be made once in a while or on festivals and special occasions.It’s a rich recipe which is high in both carbs and fat. There are a lot of ways of making Ghee Rice Healthier. For starters, you could drastically reduce the amount of ghee in the rice.The smart way to do this would be use minimum amount of ghee while making the rice and frying the onions in little oil instead of ghee. The other way of making Ghee Rice healthy is by replacing rice with millets. Foxtail Millet or Kodo Millet is a perfect replacement for the rice in this dish.This replacement will reduce the amount of carbs and fats in the dish. Ghee rice recipe is super simple.It can be made in a heavy bottom pot or instant pot.Though you can easily make it in one pot, I prefer to break down the recipe in 2 pots.The frying on stove top and the making of rice in a rice pot or instant pot. Read my review on instant pot in Indian kitchen here. Though Ghee rice is a speciality from Kerala you can serve it with anything! I usually like it with Nadan Chicken Curry ,Chicken Peralan and some Dal.I frankly love it with some Rajma too. Add half a teaspoon of sugar towards the end of frying the onions.This will keep the onions crisp. Roast the rice in ghee for 2-3 minutes before adding in the water. Deglaze the pan in which you fried the onions and nuts.Use that water to make the rice to get maximum flavour! Ghee Rice Recipe – Flavourful special occasion Rice dish made with nuts,fried onions and ghee! This is a famous Malabar rice recipe, also called as Neychoru , which can be made in Instant Pot or normal stove top. Heat 2 tbsp in a pan.Once hot, Add sliced onions and fry till they are golden brown.Alternatively do this in SAUTE more in instant pot. Remove the onions . In the same pan, sauté the nuts till golden.Set aside. In the instant pot,Choose the SAUTE mode.Add the remaining ghee and heat. Once hot, add the whole spices-cardamom, cinnamon, star anise and bay leaf and sauté for 1 minutes. To this, add the drained soaked rice(without the water) and saute in ghee for 5 minutes. To this add 2 cups of water* and salt to taste. Choose the PRESSURE COOK option.Place the lid and set the valve at SEALING position.Set the timer to 6 minutes.Open after 10 minutes of natural release. Use a heavy bottom pot.Add the remaining ghee and heat. Bring to boil and lower the heat to medium low.Cover the pot and cook for about 10-12 minutes till the rice is done. Garnish the rice with onions and cashews and raisins and SERVE. I would suggest you breakdown the instant pot method to fry the nuts and onions on stove top and do the cooking of the rice in instant pot.In my opinion that’s just faster and easier. That said you can do the whole thing in instant pot in the saute mode too. Don’t let the flavours from the pan(in which you fried onions and nuts) go waste.Put the 2 cups of water in the pan, deglaze and use for making rice. You can use a heavy bottom vessel to do the whole cooking- including the frying and making the rice. Are you looking for more Indian Instant Pot recipes?Look no further! Here are 21 Indian instant pot recipes for you!